The demand for worksheet processor jobs seems to be on the rise & recently I’ve noticed a lot of companies launching that have been claiming to pay extremely high rates for these said worksheet processors – but it all looks very suspicious. The two companies I initially came across actually both turned out to be scams & instead of paying members for filling in the worksheets as they promised they were actually taking money from them to make themselves wealthy at the processors expense. 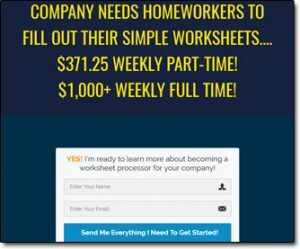 I can see why many people are searching for worksheet processor jobs – it’s because it’s easy work & many of these scam companies have set an expectation that you will be able to earn a lot of money. Sadly though that whilst worksheet processing is indeed easy, the reality is that as a result it’s a very low paying job to have. So firstly I want to point out that if any company is promising you a lot of money in return for a simple task you should definitely stop to question it. And that applies to anything to be honest – there really is no such thing as easy money. Sure, the internet is great & it does provide you with a lot of additional opportunities to earn money but it’s not magical & it’s not going to help you earn lot’s of money for little work. So yeah… Basically common sense should apply & know that if it sounds too good to be true, it probably is. Now with all that being said I don’t want to point out that there are indeed some legit worksheet processor jobs out there. Some of them will require full on employment & you’ll have to work from a physical office – but some of them can be done remotely online. What I’ve found though is that the work offered remotely is generally offered through freelancing sites like Freelancer or Picoworkers – the reason for that is because it’s typically just classed as data-entry work. This means that you’ll likely find it hard to actually get any of the worksheet processor jobs because there’s a LOT of competition on those types of freelancing sites & generally the employers hiring will pick either the people with the highest feedback or the workers willing to carry it out for the lowest price. So essentially as a newcomer you’re either not going to get the job or you’re going to spending your time filling in worksheets for very, very little money. The latter is usually the case because realistically the people wanting these worksheets filling in are just wanting it doing as quickly & as cheaply as possible. So the chances of actually earning anything decent from this are super slim. OK as I mentioned above typically when employers are looking for workers to fill in worksheets for them they will just head straight to freelancing sites & list the jobs they require completing on there. They can get instant access to a whole bunch of freelancers willing to help them process their worksheets. This means they don’t need to mess around creating & promoting their own website in order to hire people (which would be a total waste of money). They can get the worksheets completed for the lowest price possible since there will be a whole bunch of freelancers bidding to compete against each other. They can check out the freelancers past reviews & make sure that they are giving the work to somebody who can actually complete it to a good standard or within the required time-frame. So essentially as you can see it makes absolutely no sense whatsoever for an employer to create their own website through which they hire worksheet processors. BUT… Surprise surprise, all of the stand-alone worksheet processor job sites that I’ve come across to date such as Legit Flex Jobs Academy & Federal Account Recovery all require a fee from you before you get paid. This is a big, big no-no. If you’re required to pay something to start your worksheet processor job or to cover the cost of posting/filing your processed worksheets before you start earning money then I can confidently say it’s a scam. A legitimate would not charge fees in this way – since you are helping them out by processing the worksheets they are in your debt, you are not in theirs. If there were any additional fees to be covered at all then they should either cover them themselves, or they should take a percentage from the amount they pay to you… But you should never, ever have to pay anything upfront. Obviously the scam can vary, and I’m sure it does – but from what I’ve seen there are typically 2 ways in which it operates. Some of the worksheet processor job sites, like Legit Flex Jobs Academy for example, launch & promise people high earnings by completing simple worksheets online. They go over the top in selling you the dream – making it sound really easy, telling you that you can work from anywhere & promising you lot’s of money in return. The scam in this instance is that you have to pay a training fee – or a fee or some sort before you can get access to the so-called “job”. If you did happen to hand over the money (which I obviously don’t recommend you do) then you’d simply find out that the job doesn’t exist at all. The other method, and the method that catches most people out is when these sites, like Federal Account Recovery for example actually get you doing the work before they charge a fee. They make it all seem really legit, and it seems like you’ll get a good chunk of the money once the worksheets are processed – but before this happens you’ll be required to pay a small fee (usually $5) to cover things like postage or admin costs. Guess what? They’re just scamming people $5 at a time – once you submit the worksheet(s) and hand over the money you’ll never hear from the company again, you’ll realize the hard way that it was all just a phony. My Verdict – Any Legit Worksheet Processing Jobs? Yes & no – there are indeed some legit worksheet processor jobs but generally these will just be listed under the topic of “data-entry” on various freelancing websites, so if you want to do this type of work then I’d suggest you look there. The problem though is that you are not going to earn a great deal from this type of thing – generally this line of work (despite what the scam sites say) is very, very low paid & you will see yourself trading your time for next to no reward. And I would like to point out that if a website has setup specifically to offer worksheet processor jobs then it is likely a scam, since as I mentioned earlier in this post this just wouldn’t make sense from an employers point of view. On top of that if you have to pay an upfront fee, or any fee before you get your money then it is definitely a scam & should be avoided – regardless as to what excuse they come up to make the costs seem legit.